If you are thinking about switching your dog to natural organic dog food, you are onto something good! It's no secret that nutritious dog food is vitally important to maintain a healthy dog. 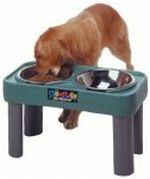 The rationale for natural dog food lies in the use of fresh raw or minimally processed ingredients, thereby retaining their full nutrient value. If you want to make Rover happy and healthy, you can do this by choosing natural dog food made with human grade fresh meats, fruits and vegetables, that are unprocessed or minimally processed by such methods as air drying, freeze-drying, or dehydration. These are the optimum methods for retaining the vitamins, minerals and digestive enzymes in tact. Preparing fresh food for your pet is quick and easy - follow along and you'll see! Why? It's made in the USA with ingredients sourced locally and because their pet food meets all the criteria essential to your dog's nutritional needs. Sojos makes it so easy to prepare fresh wholesome food for your pet. Their high quality premixed bases made from "human grade" organic home grown ingredients are available with or without grains and with or without freeze dried raw meat. This is not kibble! You just add water to rehydrate and you're done in minutes. Healthy nutritious dog food in a snap - plus, more importantly, you know exactly what your dog is eating. Makes good sense to us and to lots of other dog owners who have seen remarkable improvements in their dog's health with Sojos natural organic dog food. Complete recipe for puppies combining raw, freeze-dried turkey and omega-rich salmon with a selection of superfoods plus a targeted blend of essential vitamins and minerals. Easy to rehydrate in minutes by adding water for fresh, puppy-perfect soft meals. Your puppy dog is sure to love this recipe and come running for his dinner! A fresh and healthy grain-free, gluten-free mix of USDA meat plus wholesome, nutritious foods and nothing artificial. Perfect for all dogs and ideal for those with sensitivities to grains. As the name says, this is "complete" - all you do is add water then watch your dog enjoy the results! A fresh and healthy grain-free, nutritionally complete freeze-dried dog food. Delectable Lamb recipe that is made in the USA. Key Features: Freeze-dried raw meat in a formula that is free of GMOs, grains, soy, byproducts, fillers, preservatives, artificial colors or flavors, and no added sugar or salt. Just like the other Sojos Complete foods, your dog gets the benefits of raw in combination with a blend of other super beneficial ingredients. In just minutes your pet's complete recipe is being rehydrated while you're preparing your own meal! A fresh and healthy grain-free, gluten-free blend consisting of USDA beef plus other whole foods. Nutritious all natural ingredients with nothing artificial. Perfect for all dogs and ideal for those with sensitivities to grains. Simply add a little water, do a little dance and presto you have fresh homemade dog food! See your dog's happy face! A new taste sensation for your pet! As with all other Sojos recipes, this recipe containing freeze-dried goat and other premium ingredients, rehydrates quickly and easily. An 8-lb bag makes 40 pounds of fresh food so it goes a long way. All natural of course, no fillers, artificial preservatives, soy, by-products or anything genetically-engineered. A wholesome and flavorful mix from some of the most nutritious fruits and veggies plus eggs and beneficial herbs. Good source of Dietary Fiber, Vitamin B6 and Potassium, Vitamin A, Vitamin C and Manganese from sweet potato. Plus protein, potassium, fiber and folic acid, Vitamins K, A, B6 and E from the powerhouse cancer-protective veggie - Broccoli. All this and even more other rich sources. Naturally gluten-free and a good choice for dogs that are sensitive to grains. As with the other Sojos mixes, just add water - except, this time add your dog's favorite meat, either raw or lightly cooked. 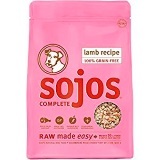 This original Sojos dog food mix is a nourishing blend of human-grade whole grains including rolled oats, barley and rye - excellent heart-healthy sources of fiber, manganese, selenium, iron and phosphorous. Along with the nutritious benefits of nuts, carob and herbs, this blend will light up your dog's day! No wheat, corn, fillers or artificial anything! 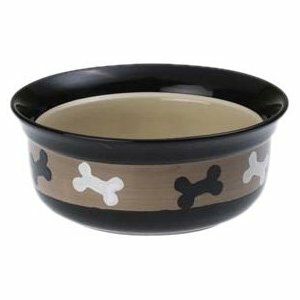 Just add water and fresh meat or poultry, either chopped or ground - plus your dog's favorite veggies for outstanding homemade food. It is preferable to use raw meat for the highest nutrient value. Dogs are essentially carnivores that have adapted over thousands of years as man's companion to eating an omnivore type of diet, which means they eat both plant and animal food. They are descended from the wolf and have a short digestive tract, appropriate for digesting raw or minimally processed foods such as is found in natural organic dog food. 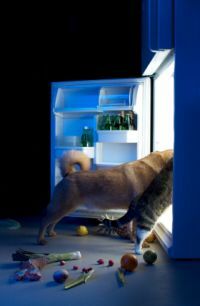 The ideal diet would contain a variety of fresh foods, because according to pet nutritionists, a pet who eats the same food over and over, can develop some sensitivities or allergy problems. If you're really busy you can still make quick, yet very nutritious meals using one of Sojos specially formulated "human grade" organic dog food mixes, to which you need only add water for hydration and fresh meat. These natural bases are available with or without freeze dried USDA meat, and with or without grains, or fruit/vegetable-based. Freeze dried dog foods, as well as dehydrated formulas, are yet another easy way to add variety, or use in combination with other food choices. Natural organic dog food can also be found in canned preparation. Again, the key is 'human grade' ingredients, without chemicals or artificial anything!